The Father Engagement Experience™ (FEE) has helped many organizations develop concise, accountable plans that address their unique organizational culture, challenges, and resources. This two-day, in-person strategic planning session facilitated by National Fatherhood Initiative (NFI) uses a structured process (e.g. storyboards, Pure Form Thinking, and multi-voting) to help organizations establish goals and identify father-engagement strategies. NFI facilitators further assist by providing insight and recommendations drawn from 23 years of experience partnering with thousands of organizations. The session results in a customized Father Engagement Game Plan™ (FEGP) that any organization can use to accomplish great things around responsible fatherhood. Using NFI’s pre-session design questions to create the structure for the FEE. NFI developed a series of pre-session design questions that helped these organizations determine the main focus of the FEE and what each organization wanted to accomplish as a result of it. Participants were able to see how father engagement fits into the overall goals, objectives, vision, and mission of their agency. Many participants had a say in how the design questions were answered, so they already had some ownership in the FEE from the very beginning. Receiving a customized FEGP. NFI provided each of these organizations with an action plan that captured every idea and next step from the session. This served as their blueprint that guided them on how to engage fathers. Integrating NFI’s programs and services. As a result of what these organizations learned during the FEE, they were able to more effectively integrate different combinations of NFI programs and resources (e.g. curriculum, brochures, tip cards, child development guides). Kansas DCF and Healthy Families Florida, for example, integrated NFI’s Father-Readiness Network Assessment™ (FRNA) into their action plans. The FRNA uses an online version of NFI’s Father Friendly Check-Up™ (FFCU) to assess multiple sites, offices, or partners within a larger network. As a result, Kansas DCF learned how father-friendliness varies between the four regions of the state (e.g. Kansas City, Wichita, East, West), by staff type (e.g. DCF staff, contractors), and by program type (e.g. Prevention and Protection Services, Economic and Employee Services). HFA learned how father-friendliness varies by program type (e.g. Healthy Families, Healthy Start, Maternal, Infant & Early Childhood Home Visiting) and by length of employee’s service. This data has informed their statewide fatherhood plans and allowed them to address issues and explore opportunities they wouldn’t have known about otherwise. Creating a fatherhood oversight group. As a result of the FEE, it became clear to each of these organizations that they needed to create a group to oversee the implementation of their fatherhood initiatives. HFF formed a Project Team and a larger Advisory Group; TFF brought on two consultants to guide each smaller fatherhood group; TN DHS established a lead agency; and KY DCF created their Fatherhood Initiative Group. These oversight groups have brought accountability and follow through to their fatherhood action plans. I have seen how the FEE has helped these organizations create large-scale fatherhood action plans that achieved their goals and objectives. I would love for you to experience better outcomes in your work with fathers and families as well. 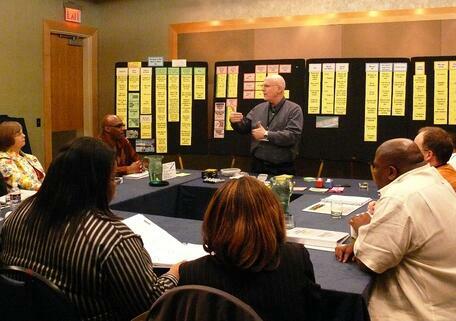 Have you developed a strategic plan to more effectively engage fathers in your work? What do you stand to lose by not using the FEE to take your organization’s father-engagement work to the next level?